Some time ago I wrote the post How did they do it? In it I asked readers for help to answer the question of how people at the the Brief Family Therapy Center developed the solution-focused aproach inductively. What I did not see precisely is how they noticed and decided that something worked. What exactly did they pay attention to and when? Meanwhile I have received some help from insiders like Wally Gingerich, Eve Lipchik, Alasdair Macdonald, Peter DeJong, Michele Weiner-Davis, Brian Cade, Daniel Gallagher, Gale Miller, and Kate Kowalski. It was great hearing from these people their accounts about what happened. each one of them provided some interesting pieces of this puzzle. Most of them shared their stories with joy and enthusiasm. One of them refered to this period as one of the most intellectually stimulating times of his career. De Shazer and Berg started their practice in 1978 and called it the Brief Family Therapy Center (BFTC). 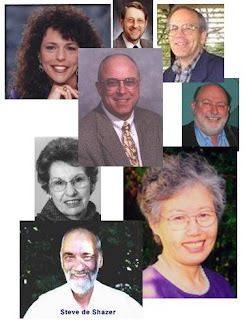 Original members of the BFTC team were Jim Derks, Marvin Weiner, Elam Nunnally, Eve Lipchik, Alex Molnar and Marilyn LaCourt. After that therapists like Wally Gingerich, Michele Weiner Davis, John Walter, Kate Kowalski, Ron Kral, Gale Miller, Scott Miller and Larry Hopwood joined (Cade, 2007). All these people have contributed in one way or another to the development of the solution-focused approach. De Shazer and Berg and their colleagues hardly had any money so they started off in their own living room. Only later were they able to hire an office. Their mission was to find out what worked in therapy. They did not want to take a specific theory as a starting point. Instead, they wanted to build knowledge about what worked in therapy inductively. They started of by identifying traditional elements of therapy and removing one element at a time from sessions. Then they observed whether the client outcome had been affected by the removal of this element. They discovered that analyzing and diagnosing problems could be removed from the therapeutic conversation without negative consequences for client outcomes. In addition to the approach of systematically removing traditional element of therapy they did several other things. One thing was that they were actively studied therapeutic "accidents" or spontaneous events in therapeutic conversations. When the therapist or the client did something that seemed to work, they discussed that and they tried it again. While trying to figure out what worked, they observed clients during actual conversations and videotaped conversations. They looked for interventions that helped clients to formulate more clearly what they wanted to achieve, that helped the client to become more confident in their possibilities and that helped to identify ideas for steps forward. Each intervention that made clients become more aware of what they wanted to achieve, more optimistic, hopeful, energetic and full of ideas, was written down, discussed by the team and used more often. As the model developed, the client's voice became a more and more important criterion. Each time a client reported that some intervention had led to a positive change they considered that intervention useful. They equated ‘what worked’ with what the client found useful. In addition to this, they did occasional quantitative studies to find out about the effectiveness of interventions (Weiner-Davis, De Shazer & Gingerich, 1987), attempts to formalize the approach into an expert system (the BRIEFER project, Gingerich & De Shazer, 1991) and several qualitative studies. They identified many interventions that often worked well which helped them build a set of solution-focused tools. But they also did another important discovery. They learned that what worked well with one person did not necessarily with the next person. This made them realize how important it was to pay close attention to how clients responded to whatever happened during the conversation and to use this. Between 1978 and 1985 the basis was created for what is now known as the solution-focused approach.